On this DVD, you'll meet seven magicians who perform and teach great commercial magic effects that combine the worlds of conjuring and gambling. Johnny Thompson is first with his version of Dai Vernon's classic Poker Deal demonstration, followed by John Mendoza, who demonstrates Three Card Monte much like you'd see it today on the streets of major cities. Michael Ammar is next with Hornswaggled, a time-honored and very entertaining short-change routine while Dan Harlan teaches a trio of effects based on an elementary card magic principle that still manages to fool. Harry Lorayne performs and teaches the 10-Card Poker Deal straight out of one of his classic books while Scotty York weaves a tale with a handful of money that will leave any audience rubbing their eyes. 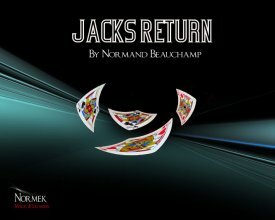 Finally, you'll be treated to a short film created by gambling expert and true sleight of hand legend Ross Bertram, demonstrating his unsurpassed skill with cards, dice, and shells.